In this unique and seemingly inspiring portrait documentary, the viewer meets Danuta Walas-Kobylińska. 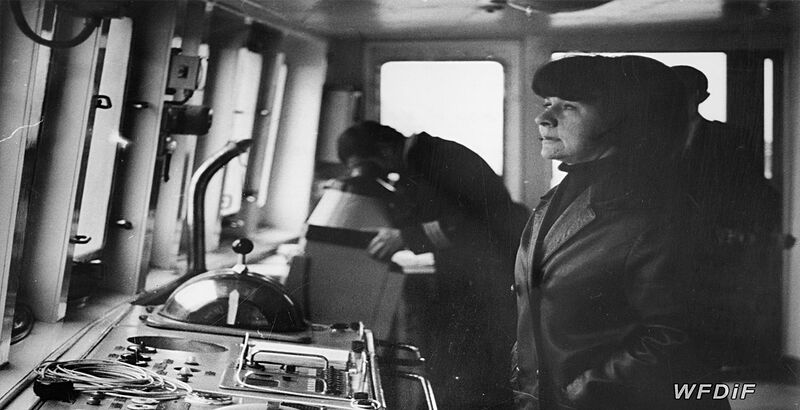 At the beginning of the 1970s, she was the only Polish woman to serve as the first sea captain. She was also the first ever female to take such a post. 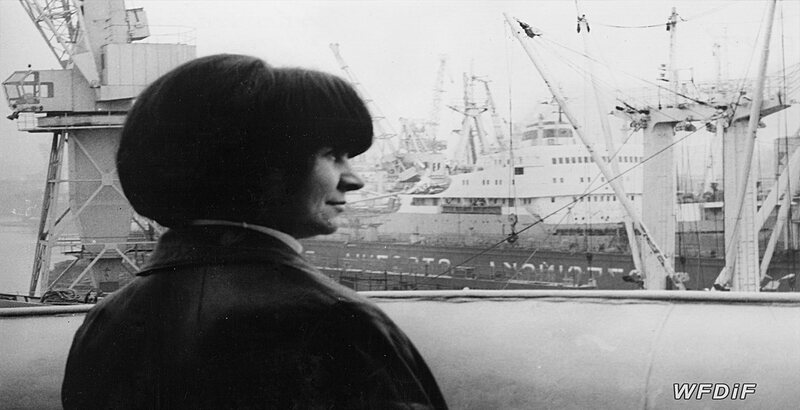 During the film, Kwiatkowska intercuts observations from the captain’s cruises on her ship MS Bieszczady with glimpses of her family life. After shots of a transporter ship coming to a halt, a voice-over provided by Andrzej Seweryn (born 1946) sets the scene before introducing the female captain. 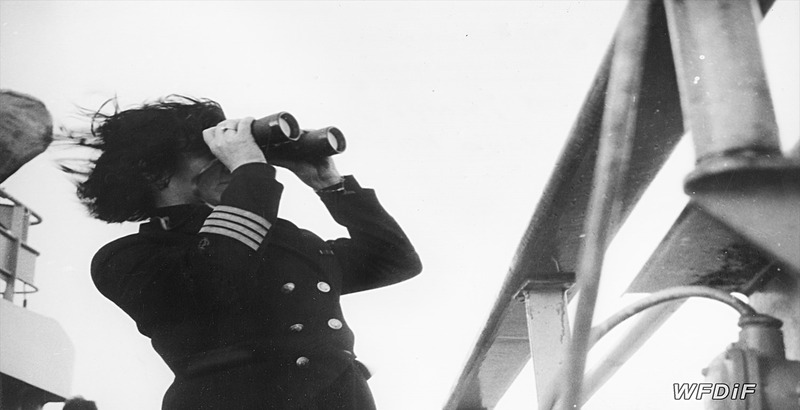 He informs the viewer that the crew are anchoring the ship as per the captain’s order and describes the size and the weight of MS Bieszczady. Finally, he introduces the woman in charge of it. We encounter Walas-Kobylińska as she is on the phone with a journalist from a popular women’s magazine, Przyjaciółka. She admits that she can only talk about men because she doesn’t see many women, suggesting that she works in a male-dominated profession. In these initial sequences, she comes across as a powerful professional figure. Even her husband serves under her command on the same ship. Here, dressed in a uniform, she seems empowered and capable of ridding of her femininity. However, it soon becomes apparent that Walas-Kobylińska still performs domestic jobs, like every other Polish woman at the time. We see her on the ship doing her washing, cleaning and cooking. She also takes pride in her feminine looks. 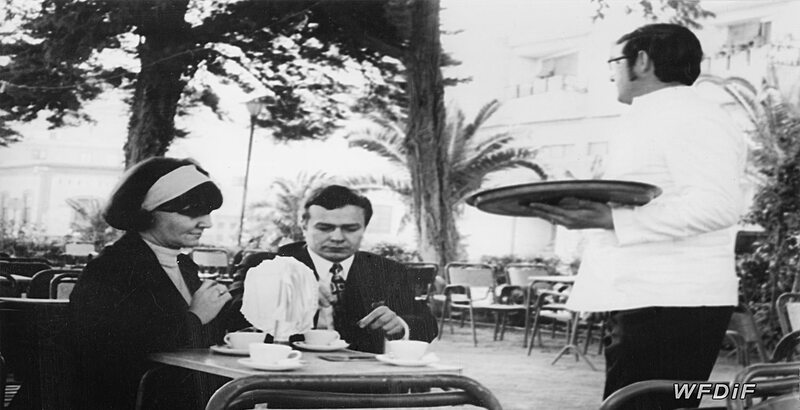 At an Italian port, Kwiatkowska shows her elegantly dressed strolling through local markets and having a date with her husband at a café under palm trees. Her life looks adventurous and balanced. That is until we learn that her job is also one of sacrifice. Her son lives with his grandmother. She can’t see him for long stretches of time, because she usually comes home only for a few hours to run errands before going back to sea. The final sequence at home closes with a few shots of a family dinner. Here the narrator says: ‘Perhaps people envy her; maybe they see her as a spoiled child of fortune. But her professional success comes at a price. This dinner with the family was too short. Tomorrow they go back to the sea’. By mixing the observations of Walas-Kobylińska’s exciting time at work with her short visits at home, Kwiatkowska points to a much larger issue of women having to balance jobs and domestic responsibilities, showing that professionally successful women always have to prioritise careers over their family lives. Happiness at both fronts is an illusion, not only for Walas-Kobylińska but for every woman in the country and beyond.